Importer US Beverage announces Innis & Gunn will be introducing two small batch, limited edition beers in the upcoming months. These beers will inaugurate two new series; Latitude and Longitude launching this month and Vanishing Point, available this fall. 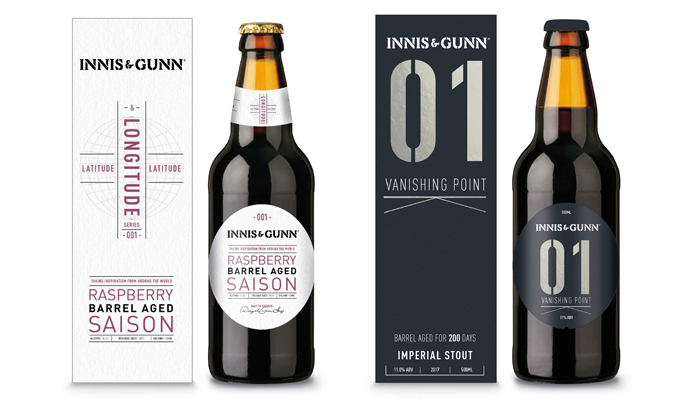 Innis & Gunn’s Vanishing Point 01 is an Imperial Stout brewed in first fill bourbon barrels, bursting with flavors of fresh ground coffee, dark chocolate, coconut and vanilla. “As the pioneers of barrel-age brewing, Innis & Gunn continues in their quest to brew innovative, delicious beers that showcase the very best of Scottish brewing craft. We are delighted to work with our wholesaler and retail partners to bring these beers to the American beer drinker,” commented Georgia Homsany, Sr. Brand Director at US Beverage. Soon to follow will be Vanishing Point 01, an Imperial Stout matured in first fill bourbon barrels for six months. The barrels and brewing ingredients are hand selected, top quality and chosen with one thing in mind – FLAVOR. The beer is big, rich and bursting with flavors of fresh ground coffee, dark chocolate, coconut and vanilla. Both beers will be served in 500 ml bottles in gift boxes. Innis and Gunn is imported into the US by United States Beverage and their products can be found at www.unitedstatesbeverage.com/brand-finder/. Since its foundation in 2003 Innis & Gunn has grown to become one of the UK’s most successful international craft beer businesses, and Scotland’s most awarded brewer, reporting continued year on year volume and sales growth. In 2017 Innis & Gunn sold more than 27 million bottles of beer around the world. Winning a multitude of awards for its unique range of oak-aged beers, Innis & Gunn was immensely proud in July 2016 to take Gold and Bronze awards in one of the largest and most renowned international beer competitions, the US Open Beer Championship, the only Scottish brewer to win. 2016 also saw Innis & Gunn win Gold and Silver in the New York International Beer Awards, and take home the accolade of Scottish Brewery of the Year. The story of Innis & Gunn started when Master Brewer Dougal Gunn Sharp experimented with aging beer in whisky casks, discovering the rich flavor this imparted in the beer. The brewer’s flagship Original Oak-Aged beer was born from this discovery, and Dougal launched Innis & Gunn in 2003. Driven by genuine passion and curiosity, Innis & Gunn has been dedicated ever since to experimentation in brewing techniques, processes and flavors, becoming ambassadors for great Scottish innovation, and exciting drinkers around the world with the unique flavors of its beers. The business has grown to be the No.2 craft brewer in the UK, No.1 imported craft beer in Canada, and No.2 imported craft beer in Sweden, and exports to over 25 countries. Recent expansion has seen the successful opening of four Innis & Gunn Beer Kitchens in Scotland, with plans for UK and overseas outlets in the next 12 months, and has established its home for barrel-ageing and innovation at the Innis & Gunn Brewery in Perth. United States Beverage (USB) is a premium craft and imported beer sales and marketing company located in Stamford, Connecticut. USB provides a national distribution network for a portfolio of premium beverage brands. 2017 commemorates United States Beverage’s 20th anniversary. www.unitedstatesbeverage.com. Previous articleEstrella Jalisco Debuts The First Foil Top Sealed Canned Beer in the U.S.